(In theaters, July 2002) Lazy and lame follow-up to the amusing 1997 film. It’s not bad per se, but it’s awfully self-indulgent, bringing back several fair jokes from the original (blowing up an alien’s head, a talking dog, the insufferable worms, etc.) and stretching them way past the point of self-diminishing return. It doesn’t help that the formidable Men in Black agency of the first film is here reduced to a bunch of incompetent bumblers. Will Smith and Tommy Lee Jones still manage to look good with what they’re given, which is saying something given the general inability of the script to build something original. Barry Sonnenfeld’s direction is featureless and the editing is sadly tepid, bringing back more memories of Wild Wild West than the original Men In Black. Hey, it does have good moments, but frankly I expected much more. I mean; how incompetent do you have to be in order not to produce comedic gold out of this premise? 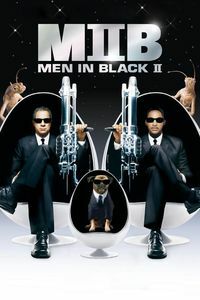 (Second viewing, On DVD, January 2003) It’s lame, boring, repetitive and self-indulgent, but for some strange reason, Men In Black II is not completely worthless. Despite showboating like no one else, Will Smith manages to remain likeable, and Tommy Lee Jones still shines whatever the lines he’s fed. The script might be a trite hack-job recycling all the elements of the first film ad nauseam, but whatever imaginative deficiencies it has, at least some of the production aspects of the film are quite nice. The 2-disc DVD package quickly gets tiresome, though, combining an endless amount of repetitive promotional material that actually thinks this is like, the best movie ever. Director Barry Sonnefeld’s commentary is occasionally annoying, but probably worth one listen. Despite numerous references to “the original ending” (which featured the World Trade Center), a curious void exists when it actually comes to showing us what it was about. Could this be yet more cowardly behaviour from a studio which allowed such an unremarkable film to escape from development? You’re not forced to watch the film to answer.